I have some other recipes to share with you that I’ve been concocting with my mother while I’m here in the great North Woods. But, I forgot my camera cord and can’t download any pictures. Oops. Also, this trip is turning out to be a busy one. Without much time for musings and ramblings about food. Nope. We’re running around looking at flowers, checking on dresses, practicing hairstyles (or, more accurately, having hairstyles practiced upon us). You see, we’re planning a wedding. And, in answer to your question (in case you are a careful reader and just put two and two together, and found yourself saying, “heyyy, wait a sec…”), yes, Joel and I are already married. But, we still haven’t had our wedding! So, we’re gearing up to say our vows in the eyes of our friends and communities and to have a wonderful celebration, come October. But, I didn’t want to send you all into the weekend without something delicious to think about. Luckily, I have a recipe I created a while back that I just haven’t found the perfect opportunity for sharing yet. But, I think this may be it. So, in honor of being home in Minnesota (I haven’t lived here in years, but let me say, Minnesota is definitely still home!) I’m going to share with you a staple of the Midwest – and Lutheran church basements in particular – a casserole. Or as it is more properly called, a hotdish. My mom, being a foreigner, pretty much never made casserole while we were growing up. I think she tried once, having gotten a recipe from a neighbor, and she was so proud of herself. At any rate, casserole never became a major part of my repertoire. But, given that everything retro is making a comeback. I think it might be time to give casserole a second look. I was inspired by our friend Bea Ojakangas’ The Great Casserole Cookbook to try a little casserole reduxing of my own. This is not your standard, dump together a can of soup, a can of tuna, some noodles, and call it a day tuna noodle casserole. I figure, even if we’re experiencing some nebulous nostalgia for the midcentury, this does not need to include nostalgia for canned cream of anything soup. 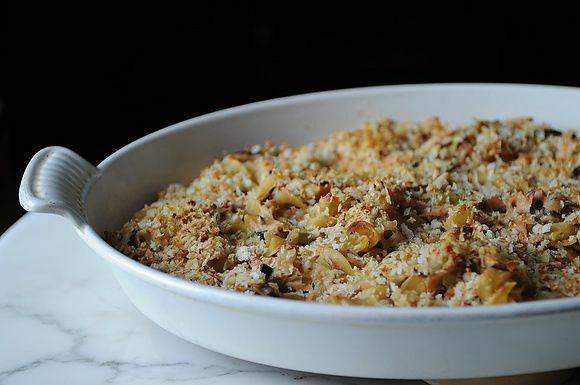 So, this casserole gets made over with a freshly made bechamel, meaty sauteed mushrooms, a shower of freshly chopped herbs, and a crispy topping of golden, garlicky breadcrumbs. This means you’re going to have to be willing to chop, and whisk, and clean a few extra pots. But, it will be worth it, I promise! You can also save on pots by using the same pot to sautee the mushrooms, and the onions, and to make the sauce, if you give it a quick wipe clean in between. Or you can take my approach, which is use all the pots and let someone else do the dishes! Preheat your oven to 350F. In a large sautee pan, heat 1 Tbs. of butter over medium-high until foaming. Stir in mushrooms and cook until mushrooms have given off all of their liquid and cooked through (10 or so minutes). Season lightly with salt and pepper, transfer to a bowl and set aside. Add another 1/2 Tbs. butter to the frying pan, then cook onion, shallot and celery together for about 5 minutes, until softened. Stir in the chopped herbs and the sherry and cook for another 2 minutes. Stir the mushrooms into this mixture, then set this aside. In a saucepan, heat 3 Tbs. of butter over medium-high until foaming. Stir in the flour to make a roux and cook for about 2 minutes. Then whisk in the milk and chicken stock, bit by bit, to make a smooth sauce. Cook, stirring, until just slightly thickened (another minute or two). Then add the lemon zest and season with salt and pepper to taste. Flake the tuna and combine the tuna, the white sauce, the mushroom-onion mixture, and the noodles all together. Grease and 8X8 inch baking pan and transfer the casserole mixture into it. I’m a huge fan of taking old recipes and giving them a fresh, new makeover. I’m also a huge fan of tuna noodle casserole in a guilty-pleasure sort of a way, so I found this recipe particularly appealing. Can’t wait to try it! This sounds like a TRUE casserole!Goodluck withg all the wedding preparations! 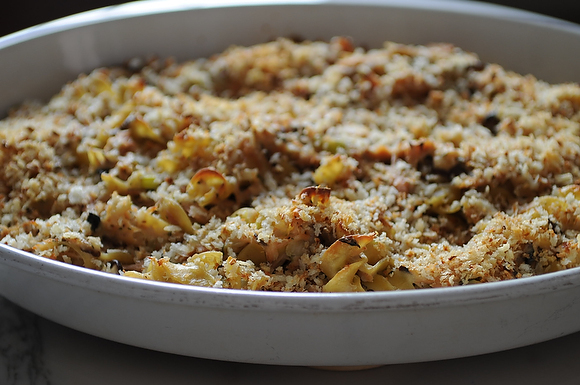 You are currently reading Tuna noodle casserole – redux at Five And Spice.